This is the pre-publication version which was subsequently revised to appear in Creation 30(1):35–37. Just as in years past, the headlines announcing the latest study of anole lizards proclaimed evolution as fact. ‘Leggy lizards evolve in fast-forward’,1 ‘Short legs win evolution battle’,2 and ‘quick evolution at work’3 were typical. But closer inspection of the reports of what the researchers actually observed,4 just as with earlier studies,5,6,7,8,9 soon showed that the latest island lizard goings-on, as in years past, have nothing to do with ‘goo-to-you’ evolution. The researchers, led by Jonathan Losos of Harvard University, studied brown anole lizards (Anolis sagrei) on small islands in the Bahamas. These lizards normally spend much of their time on the ground. However, as previous investigations have shown, brown anoles progressively become more arboreal when a ground-dwelling predatory lizard is introduced onto their island. That is, they learn to spend more time up in trees to escape being eaten. In the latest study, the researchers introduced the large predatory lizard Leiocephalus carinatus to six islands to see what impact it might have on the brown anole populations, compared to six islands which they kept predator-free. After six months, brown anole populations on predator islands were cut by at least half, with longer-legged individuals (being faster and better able to elude the predators) surviving in greater numbers than their shorter-legged brethren. However, six months later, by which time many brown anoles on predator islands were spending more time in trees, the numbers of short-legged lizards, which are better climbers, had bounced back. Note that what we are seeing here is natural selection in operation—not molecules-to-man evolution, as there has been no increase in genetic information. During the first six months, natural selection culled many shorter-legged anole lizards from the population—in the battle for survival, they were the ‘losers’ while the surviving longer-legged anoles were the initial ‘winners’. But with the shift to a more arboreal lifestyle, the surviving shorter-legged ‘losers’ became ‘winners’—note, not ‘gainers’, because they have not gained any new information, and therefore, have not ‘evolved’. So, genetically, we have lizard ‘losers’, not ‘gainers’, and therefore no evolution. Table showing examples of where the anole lizard reports got it right, and wrong. Original report in Science4 ‘… selection dramatically changed direction over a very short time, within a single generation, favoring first longer and then shorter hindlimbs’. ‘… may often be the key in driving extremely rapid reversals in evolution’. National Geographic News14 ‘… natural selection— can shift like the wind’. ‘The evolutionary experiment … reveals that, even though evolution can seem like a slow process, its driving force—natural selection—can shift like the wind’. ‘evolutionary change can sometimes occur very quickly’. Times Online10 ‘These changes occurred within a single generation, showing how the effects of natural selection can play out very quickly’. ‘There’s nothing like the threat of being eaten to make an animal evolve in double-quick time’. 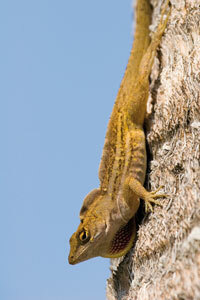 ‘Twice within a year the brown anole lizard has evolved changes in its body and behaviour to outwit a predator’. ‘In the first six months the brown anole, Anolis sagrei, developed longer legs so that it could outrun its predator’. LiveScience2 ‘… when island lizards were exposed to a new predator, natural selection occurred in a six-month period, first favoring longer and then shorter hind legs’. ‘In a reptilian version of “Survivor”, lizards with longer legs ultimately get booted from islands by their short-legged opponents’. Leggy lizards evolve in fast-forward, New Scientist 192(2579):18, 25 November 2006. Return to text. Bryner, J., Short legs win evolution battle, LiveScience, 4 January 2007. Return to text. Yong, E., Natural selection does a handbrake turn—quick evolution at work, Not exactly rocket science, 4 January 2007. Return to text. Losos, J., Schoener, T., Langerhans, R., Spiller, D., Rapid temporal reversal in predator-driven natural selection, Science 314(5802):1111, 17 November 2006. Return to text. Cohen, P., Reptiles don’t leave evolution to chance, New Scientist 147(1995):10, 16 September 1995. Return to text. Wieland, C., Latin Lizards: Logos vs Lottery, Journal of Creation 10(2):170, 1996. Return to text. Losos, J.B., Warheit, K.I. 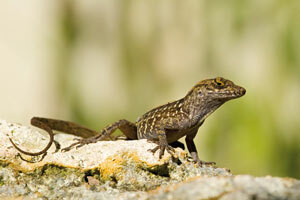 and Schoener, T.W., Adaptive differentiation following experimental island colonization in Anolis lizards, Nature 387(6628):70–73, 1 May1997. Return to text. Fast lizard changes delight creationists, Creation 19(4):9, 1997. Return to text. Smith, L., Darwin got it right—it’s survival of the fastest, Times Online, 4 January 2007. Return to text. Note that Darwin was not the first to identify the reality of natural selection. See: Grigg, R., Darwin’s illegimitate brainchild, Creation 26(2):39–41, 2004. Return to text. See also Wieland, C., Brisk biters—fast changes in mosquitoes astonish evolutionists, delight creationists, Creation 21(2):41, 1999. Return to text. And if, in time, all the long-legged anole lizards were wiped out, the short-legged ‘winners’ would similarly represent a population of ‘losers’, with the genetic information for long-leggedness having been lost. Return to text. Norris, S., Evolution’s ‘driving force’ shifts based on behavior, study says, National Geographic News, 4 January 2007. Return to text.